I finished two fabulous books this weekend. The first was Booked by Kwame Alexander. This man is magical - he has such a gift with words and telling a story. Which makes this story that much more delicious since the main character says of himself, "... the truth is you HATE words." The main character, Nick, has a dad whose job is words; he's even written a dictionary of unusual words and their definitions; he constantly reminds Nick to study said dictionary. All this studying has had an adverse effect on Nick; he strongly dislikes words. But all that studying has had an influence on Nick rather he wants to admit it or not. 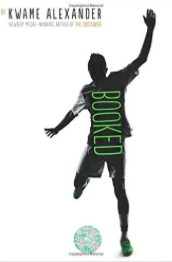 One of the many joys of Booked is how Kwame Alexander intersperses so many great vocabulary words into Nick's speech. For a word lover, this book is a must! Much like the 2nd book I read, Booked has some wonderful, quirky supporting characters. One of my favorite scenes takes place in the hospital when the librarian from Nick's school, The Mac, reads aloud to Nick for two hours and created magic with his voice and flow. As a reader, I got a kick out of how much effort Nick puts in to not reading. So another favorite part is when he begins to read Out of the Dust, and by "page 60 the monsoon comes and the book is 'unputdownable'." I love that Nick gets sucked into the story of the book. This book, as well as the 2nd book I read, deals with the reality of divorce and how that affects all members of that family unit, especially the children. It's a realistic look at a very troubling time for a child when their family splits apart. This book is coming out tomorrow; I highly recommend getting Booked!! In my second great read, Linda Urban has a brand new book out titled Weekends with Max and his Dad. I was able to finish it yesterday, and I am so excited for this to get in the hands of young readers for many reasons. The first, and foremost, is because this book is just so delightful. Max is a great character, and the supporting characters are all full of a great kind of quirkiness that makes meeting them fun for the reader. In addition, Weekends with Max and his Dad is divided into three sections, which will make it easier for transitional readers to get through one section and maintain the story line the entire way. The fact that all three story lines are the backdrops for what it is like to have divorced parents, and only be with your dad in his brand new apartment is another wonderful layer. It allows some readers in similar situations to have a window into a world of divorce that is similar to theirs. Not only would this be a great book to have in classroom libraries, but guidance counselors could benefit by adding this book to their collection of books to help children in similar circumstances. 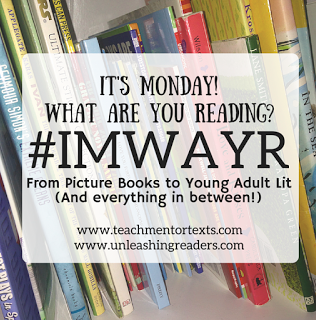 Linda Urban's books were always a hit in my classroom, and I envision readers falling in love with Max and the other quirky supporting characters in the stories. The good news is that this book appears to be the first book of a series. I look forward to finding out what adventures Max will get into next! The even better news is Weekends with Max and his Dad comes out tomorrow!!!!!! I've read both as well and loved them. I'm really looking forward to Urban's series. I think it's going to be a great one for kids. I am so excited about both of those - especially Booked! Thanks for sharing. Both books sounds good. Is Booked written in verse? 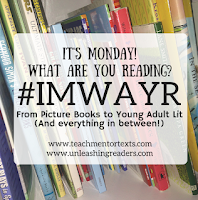 Here is what I read last week. Happy reading! I'm really excited to share Booked with kids at the library, I know we have a lot of soccer-mad kids, so I'm sure this will appeal to them! Booked just arrived today --can't wait!!!! Thanks for the review of both --don't know the other series either. I just saw Clare shared your post on FB. How did I miss this Monday? Anyway, those two are on my list, someday soon! Thanks, Karen!